The crossing was originally created to protect Canley Lane, later renamed Canley Road and was located by rail between Coventry station and Tile Hill station and by road between Hearsall Common and Fletchamstead Highway. The Halt was very much a product of the time looking very austere being built to a utilitarian design and constructed from brick and concrete. Although officially named Canley Halt the prior existence of Canley Gates signal cabin led occasionally to some confusion with both LMS and BR sources referring to Canley Gates (Halt). The station has never handled any general goods traffic because of Coventry station, with its extensive facilities, being little more than a mile away. A New Street to Coventry six-car Diesel Multiple Unit set is seen arriving at Canley Halt’s up platform. 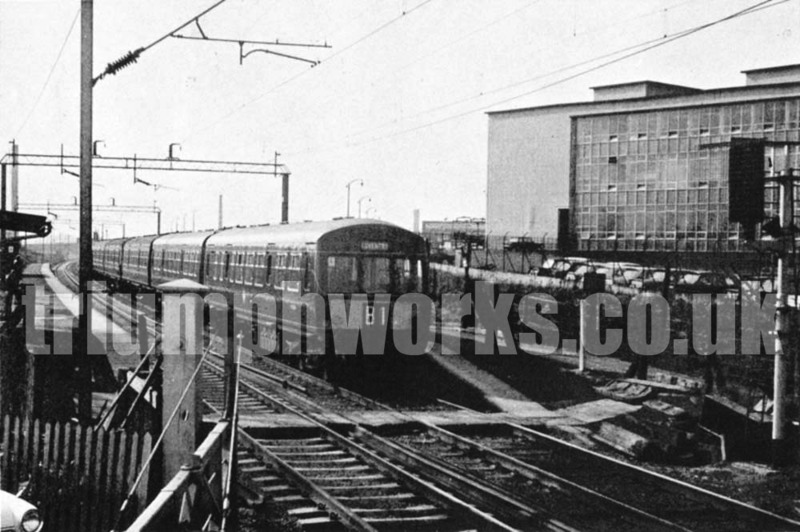 The overhead electric wires are in place but as the passenger service is still being served by DMUs and not Electric Multiple Units the date must be before 6th March 1967 when the electrification of the Rugby to Birmingham line was completed. The car factory, as well as other nearby works, would generate considerable number of pedestrians at closing times which were the bane of the signalman’s life as they often took considerable risk of crossing the lines without looking or in front of a train. The steel footbridge was removed for both rail passengers and pedestrians as part of the electrification of the Coventry to Birmingham line. Pedestrians using the level crossing were then forced to wait at the barrier when trains were passing. The railway traffic included both stopping trains serving which also serviced Canley Halt as well as regular the Inter-City trains. These trains necessitated the closure of the crossing to road traffic some 135 times a day, regularly causing extensive queues and diverting traffic to other routes. The closing of the barrier equated to a total barrier down time of 30 minutes in the evening peak hour between 4:00 pm and 5:00 pm. Today the station remains open although extensively rebuilt but it is no longer a crossing as the frequency of rail service resulted in the gates being closed for too longer a period. Road traffic proceeding to the City centre now uses a route via Fletchamstead Highway.